Palm trees and tropical vegetation growing among the abandoned machinery at Kauai's Lihue Mill. 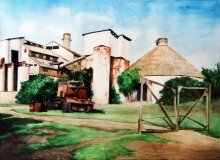 The sugar mill closed in 2001 after 150 years of operation. Today the mill has been completely dismantled.